Best Naturals have two different versions of Garcinia Cambogia products. One of them contains 1000mg of Garcinia Cambogia per capsule with 60% Hydroxycitric Acid (HCA) while the other consists of 1500 mg servings of Garcinia Cambogia distributed over 3 capsules with a ratio of 50% HCA per serving. In our review we will talk about both of these products to see how they compare to our other reviewed supplements. Both of these products by Best Naturals come at unbelievable cheap price. The 1000 mg option has a total of $24.99 per bottle while the 1500 mg option is priced at only $14.99. These amazing prices might look good to some, but we caution our readers to think about why they are so cheap. We believe that the many mixed reviews of this product may lead to the answer. Cheap cost usually leads to cheap products. The Best Naturals company may get some people to believe that they have a good product with big numbers such as 1000 mg or 1500 mg per serving. But, as many of our readers know, the amount of Garcinia Cambogia is not the only thing that needs to be considered. HCA is the main ingredient in Garcinia Cambogia and without a high concentration percentage of HCA then the Garcinia Cambogia taken is not as effective. This could explain the $14.99 cheap price of the 1500 mg option from Best Naturals. This option only comes with a 50% concentration of HCA per 1500 mg serving. We usually recommend our readers to seek products that have over a 60% concentration of HCA. At 60% HCA, the 1000 mg option is also a bit low. Cheap price. High dosage amount of Garcinia Cambogia at 1000 mg and 1500 mg respectively. Low concentration of HCA, low customer reviews, out of reach free shipping, complicated and difficult return policy. Aside from the actual pills, our researchers would rate the customer service from Best Naturals as lower than other supplement providers. For one thing, their "free shipping" option is conveniently just one cent more than one bottle of their 1000mg option bottle. Clearly, this is a trap to get customers to buy more than they want. Unfortunately, if customer's fall into that trap they may hit even more problems when they read the "30-day money back guarantee". This money back guarantee initially sounds great, but in order to receive your refund you must have not damaged or opened any of the bottles. What is the point of having a money back guarantee if if does not let you try the product? What's worse is that the money back guarantee does not include the cost of shipping so no matter what you will not get all your money back. Furthermore, we caution our readers to make sure they correctly enter their shipping address when purchasing the product. If you do not and Best Naturals has to restock your product, then they charge a "25% restocking fee" on the refund of your order. 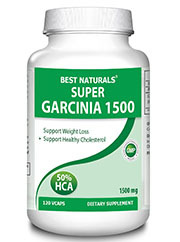 Best Naturals Garcinia Cambogia main characteristics: 1000mg, 50-60% HCA. The hidden policy fees and nuances of this product make it hard for our researchers to fully recommend it. It also is not great that the pills come with a low concentration of HCA and low reviews. Some of our readers may think it is worth it because of the deceptively low price, but we caution those readers to think about the fact that it may not work. Sletrokor Garcinia Cambogia is a pretty good product; we rated it as #2. Pure Garcinia Cambogia has a good price, but results are not the best. We rated it as #3.